We booked here on spec early on a Saturday night for a late dinner. We arrived and were warmly greeted and seating at the bar whilst our table was prepared. We had a couple of Martin Rouge’s and perused the menu; which was a great delight to us as there is a really breadth of choice with authentic dishes. We were seated and not long after our orders were taken; Caprese and Gameroni All Aglio (prawns with cannellini beans and fresh chilli) followed by Sea Bass and Veal with a side of Zucchini. 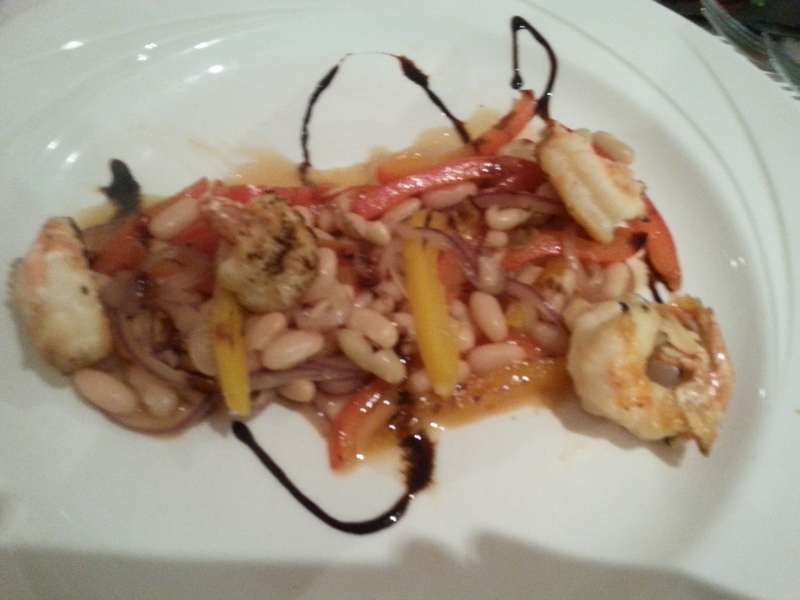 The starters arrived and were well presented, my prawns however were overcooked and the chilli had been left out of the dish; the waiter was quick to resolve this and the new dish was tasty; I would say if I could improve this dish it needed a dash more sauce to make it richer. Main course was again well presented, the Sea Bass was tasty but the sauce could have taken some more seasoning and a further reduction. The veal dish was tasty enough however the escallops were well done and the sage flavour was too subtle. The Zuchinni was cooked to perfection. For desert there was only once choice the Tiramisu – which was a slice of heaven, hats off to the pastry chef for this beauty. Atmosphere was great in the restaurant, a really lovely buzz, while the staff were really busy there was no drama or fuss. They checked on us regularly and corrected the issues to took feedback well. Winder winner… 3/5 service was excellent, a lot of restaurants could learn from this team although there is still room for improvement. We will be back and hope that we become regulars at Felice’s Bella Roma.